Three genetics, development and cell biology (GDCB) students earned their doctorates and one GDCB student earned her master of science during the spring 2018 commencement. Earning a Ph.D. were Soujanya Akella, Lauren Laboissonniere and Laura Schultz-Rogers. Axelle Weeger earned an M.S. Akella’s major was genetics, and her major professors were GDCB Emeritus Faculty Marty Spalding and GDCB Professor Steve Rodermel. Laboissonniere’s major was neuroscience, and her major professor was former GDCB Assistant Professor Jeff Trimarchi. Schultz-Rogers’ major was genetics, and her major professor was GDCB Associate Professor Maura McGrail. Weeger’s major was in genetics and genomics, and her major professor was GDCB Assistant Professor Hua Bai. After graduating in spring, Weeger began preparations to pursue a Ph.D. in genetics and genomics at Iowa State University in fall 2018. She will enroll in rotations and will begin looking for a new area of study. “I’m looking forward to teaching as a TA again and continuing my path with ISU,” Weeger said. Congratulations to these four GDCB alumni on their success, and best of luck in the future. Four genetics, development and cell biology students graduated in spring 2018. 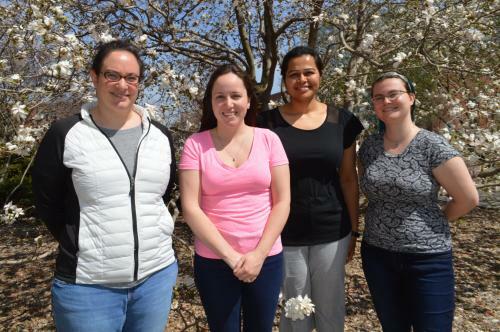 From left are Laura Schultz-Rogers, Ph.D. (genetics); Lauren Laboissonniere, Ph.D. (neuroscience); Soujanya Akella, Ph.D. (genetics); and Axelle Weeger, M.S. (genetics and genomics).